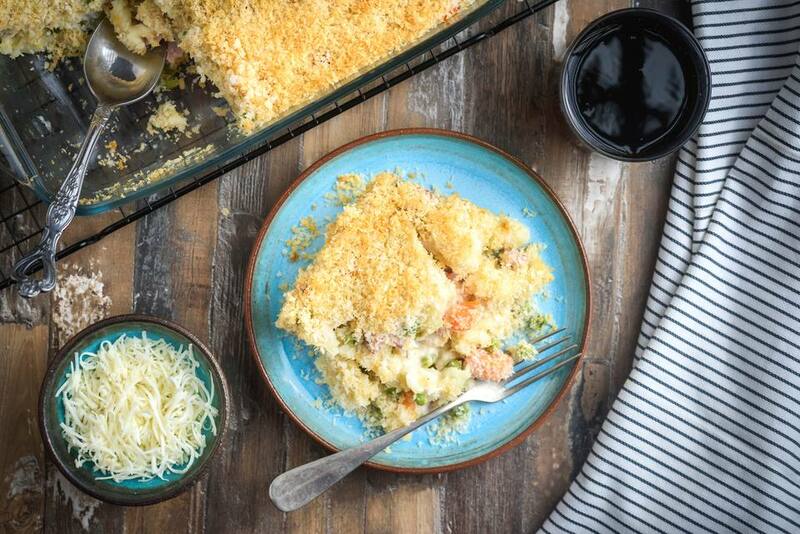 Swiss cheese and a little diced ham give this casserole extra flavor. Serve this casserole with sliced fresh tomatoes or a tossed salad for a fabulous family meal. Leftover croissant crumbs or toasted breadcrumbs would also make a great topping for this dish. Cook pasta (you can use mini fusilli or farfalle, macaroni, or other shapes) in boiling salted water following package directions. Drain, rinse and set aside. Heat butter in a large skillet and saute the onion and celery over medium-low heat until softened. Add ham and stir in flour until well combined. Gradually stir in the milk until thickened. Add marjoram, salt, and pepper. Stir in the cheese, turkey, and peas and carrots, if using. Add the cooked pasta and blend thoroughly. Spoon the pasta mixture into the prepared baking dish. Combine breadcrumbs with 1 tablespoon melted butter; sprinkle over the top of the casserole. Bake for 25 to 30 minutes, until bubbly and the topping is browned.